In 2019, the University of Cincinnati celebrates its bicentennial anniversary with a year of events and programs. UC Libraries is marking the occasion with an exhibit “UC in Print: Books Documenting 200 Years of the University of Cincinnati.” Available for viewing on the fourth floor lobby of the Walter C. Langsam Library, the exhibit includes books from throughout the libraries and covers the history, notables, sports and culture of the university. Songs of the university, the architecture, football and basketball, even a children’s book starring the UC Bearcat can be found in the exhibit alongside writings from former UC presidents Raymond Walters, Walter Langsam and Joseph Steger. Histories and commemorations of numerous UC colleges, including books on 50 Years of UC Blue Ash College, the 25th Anniversary of Clermont College, the College of Engineering and the College of Nursing, are represented in the exhibit. A timeline spanning the length of the display marks key dates in UC’s history from its founding in 1819 to the appointment of the first librarian in 1892 to more modern times such as UC becoming a state university in 1977 being named a top 25-research university. The two newest books in the exhibit, In Service to the City and From the Temple of Zeus to the Hyperloop, were published for the university’s Bicentennial by the University of Cincinnati Press and represent both the university’s rich history as well as its innovative and exciting future. 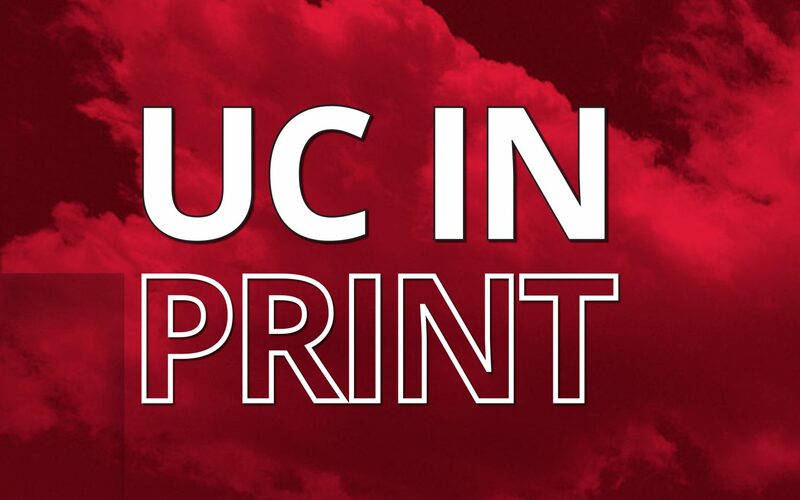 “UC in Print” was curated and designed by Melissa Cox Norris, director of library communication, with Kevin Grace, university archivist and head of the Archives and Rare Books Library, and Sam Kane, library communication design co-op student. A bibliography of the books included in the exhibit is available in print on site as well as as a PDF online. A list of UC-related online exhibits is also available on the library’s web site at https://www.libraries.uc.edu/arb/exhibits.html.